Hi there, it’s been a very busy week and not a lot of blogging or preparation for the show has been done. This weekend will have to be well used as the I Knit Fandango show is practically around the corner so I have to finish my sock knitting kits and my kits for the Marin shawl by Ysolda Teague. 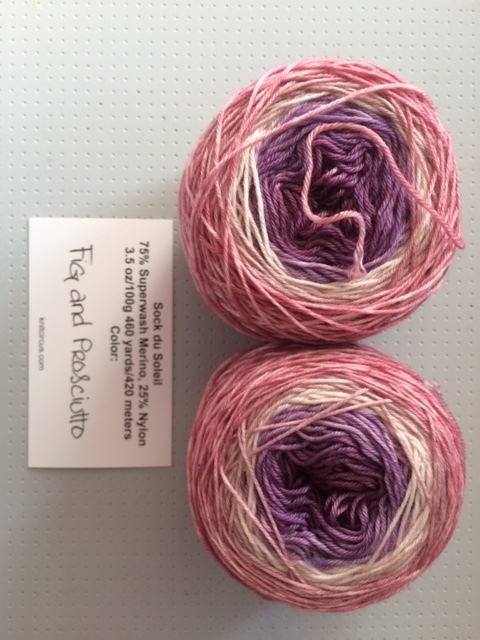 I’m also going to prepare kits for a crochet shawl – a design by a young French designer. The pattern is called Muscari by Mam’zell Flo. I’m excited about this new crochet kit which will be my first crochet kit and also the first kit including a pattern by a French designer. 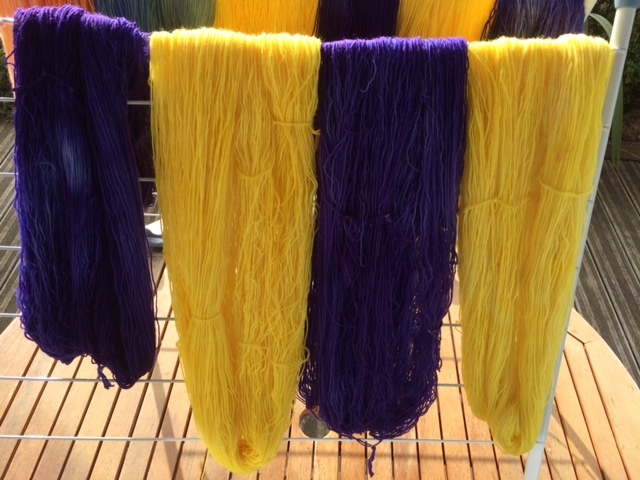 So lots of work for me and I hope that next time I come back to post I will be able to share some success stories and pictures with you here of my finished/prepared kits and yarns. Now the title of todays post is “branching out on social media”, we all enjoy and use social media up to a certain extent, some use it more than others. I began using Facebook and it was really the only social media I used for my business. Then I went on to Twitter but that is something I have not really used to its full potential so that is something I need to look into. I also created an account on instagram and Flickr but have more or less abandoned those unfortunately. Today I mostly concentrate on Pinterest which I find to be super inspiring and I spend a lot of time there just looking at great ideas and beautiful things. My following on Pinterest is growing and I hope to continue in that direction. I didn’t quite understand the interest in using Pinterest at the beginning but boy has my opinion changed since then! I just love finding inspiration for colours, knits, crochet items, jewelry, and so forth. Endless daydreaming and inspiration for any crafter. And then there is Google+, now I’m told it is important to be present on Google + so I just recently did something about that and I now actually share my blog posts on Google +. I’m curious, what is your favorite social media? Where do you connect with friends/family and other crafters? Do you think that it is important for a company to be present on ALL social media outlets or would you think it is better to just concentrate on 1-2 and do them to the fullest ? That is all for today folks, I have not done a lot of knitting this week so no pictures of in progress items. I do have a confession, I did RIP my socks out again!!! This must be like a limited curse on me these days and hopefully I’ll escape from it soooon! I ripped out the socks and cast on immediately so now I’m doing them 2 in 1 style and of course so far so good:) Cross my fingers and hopefully I’ll be able to share a picture of these future socks soon. Talk about a difficult choice! Looking at these patterns I actually want to make a number of them so to choose just one will be difficult. After a simple browse my top patterns would be Melisandre and Bjork Socks but I’m not decided yet. What do you think? Have you knit any of these patterns yourself and if so what did you think of it? Do you maybe even have a picture of the socks that you would like to share with us? 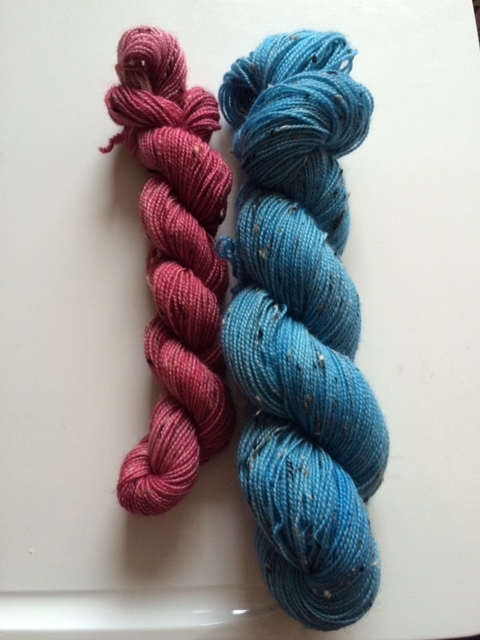 I’m currently dyeing like crazy for the show in London (I Knit Fandango) and now I’m working on sock kits. These will be for the Philosophers Walk Socks by Pleximo who has graciously given my authorisation to include her pattern with my yarn. I’ve almost finished a pair of these myself and I find the pattern both amusing to knit and a beauty to look at. It is great for two colour knitting and I think that stark contrast colours work great for this. I’ve already done kits like this before for my Etsy shop. 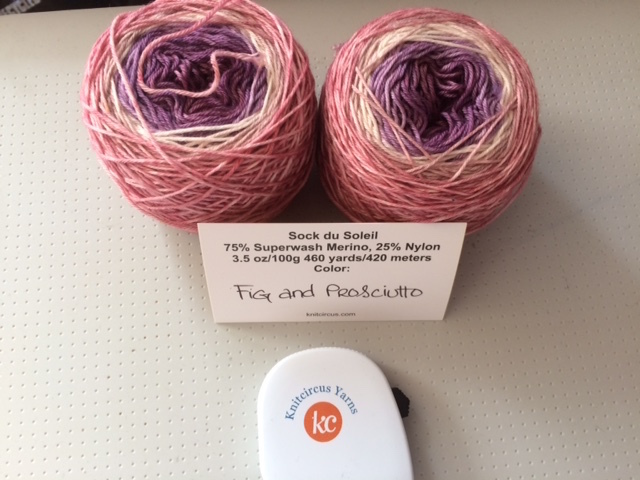 There is one kit left there – for the shop the kits included 2x 50gr skeins of the main colour and 1 x 50gr skein of the contast colour. 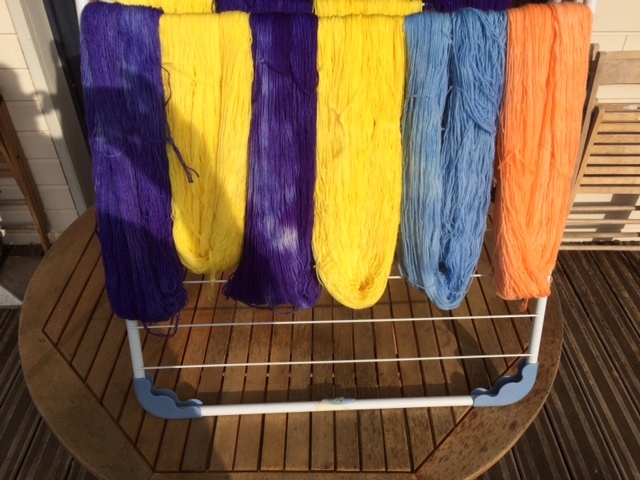 This time I will be doing 2 x 100 gr skeins, one of each colour so you can decide yourself which will be the MC and which will be the CC. You could even do one set up for the first sock and then do the opposite for the second sock. Either way the choice will be yours 🙂 The yarn I’m using is 75% superwash merino and 25% nylon which is just perfect for socks. So there will be: purple and yellow, blue and orange and today I’m doing some pink and grey and maybe some coral and light blue/green sort of colour. 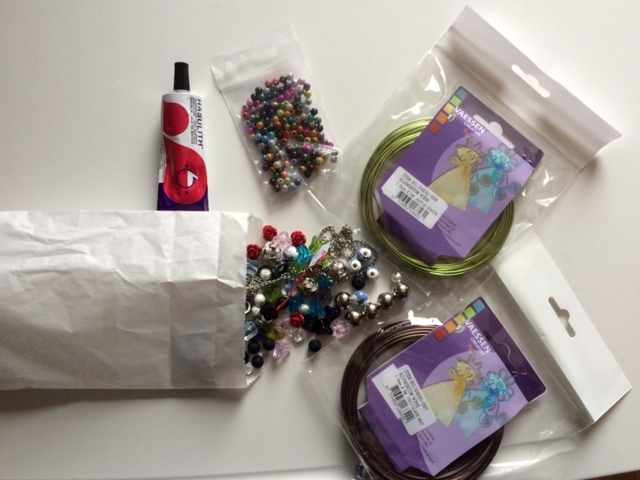 The kits will be in their own coton project bag and will include some hand made stitch markers as well. I think those will be quite nice and hopefully a success at the show. 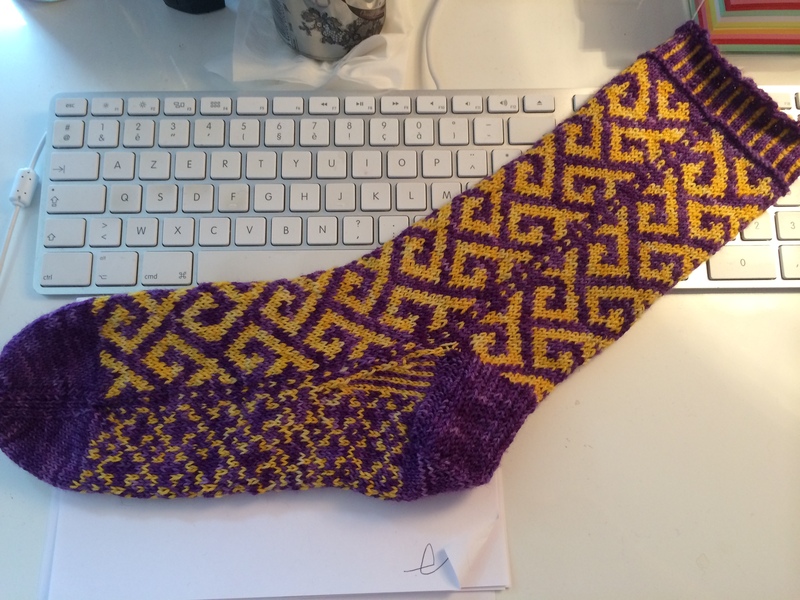 Hi there, yesterday I talked about making up some sock knitting kits. 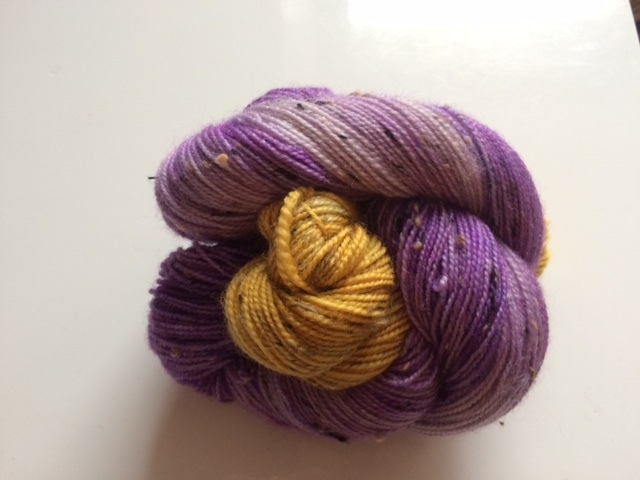 The idea is for 2 coloured socks and I will hand dyed my yarn in 2 contrasting colours. The main skein is for the leg and foot of the sock and the smaller one is for the heel and cuff. I’m also working on a super simple pattern that I could share with you and add as a little bonus with the yarn.